’Ēl (or ’Il, Ugaritic: 𐎛𐎍; Phoenician: 𐤀𐤋; Hebrew: אל; Syriac: ܐܠ‎; Arabic: إل‎ or إله‎; cognate to Akkadian: 𒀭, translit. ilu) is a Northwest Semitic word meaning "god" or "deity", or referring (as a proper name) to any one of multiple major ancient Near Eastern deities. A rarer form, 'ila, represents the predicate form in Old Akkadian and in Amorite. The word is derived from the Proto-Semitic archaic biliteral ʾ‑l, meaning "god". 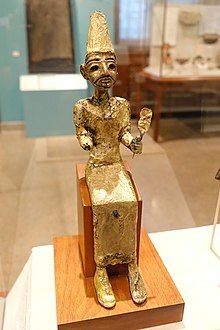 In northwest Semitic use, El was both a generic word for any god and the special name or title of a particular god who was distinguished from other gods as being "the god". El is listed at the head of many pantheons. In some Canaanite and Ugaritic sources, El played a role as father of the gods or of creation. However, because the word sometimes refers to a god other than the great god Ēl, it is frequently ambiguous as to whether Ēl followed by another name means the great god Ēl with a particular epithet applied or refers to another god entirely. For example, in the Ugaritic texts, ʾil mlk is understood to mean "Ēl the King" but ʾil hd as "the god Hadad". The Semitic root ʾlh (Arabic ʾilāh, Aramaic ʾAlāh, ʾElāh, Hebrew ʾelōah) may be ʾl with a parasitic h, and ʾl may be an abbreviated form of ʾlh. In Ugaritic the plural form meaning "gods" is ʾilhm, equivalent to Hebrew ʾelōhîm "powers". In the Hebrew texts this word is interpreted as being semantically singular for "god" by biblical commentators. However the documentary hypothesis developed originally in the 1870s, identifies these that different authors - Jahwist, Elohist, Deuteronomist, and the Priestly source - were responsible for editing stories from a polytheistic religion into those of a monotheistic religion. Inconsistencies that arise between monotheism and polytheism in the texts are reflective of this hypothesis. The stem ʾl is found prominently in the earliest strata of east Semitic, northwest Semitic, and south Semitic groups. Personal names including the stem ʾl are found with similar patterns in both Amorite and Sabaic—which indicates that probably already in Proto-Semitic ʾl was both a generic term for "god" and the common name or title of a single particular god. In a Hurrian hymn to ʼĒl (published in Ugaritica V, text RS 24.278), he is called ’il brt and ’il dn, which Cross (p. 39) takes as 'ʼĒl of the covenant' and 'ʼĒl the judge' respectively. Amorite inscriptions from Sam'al refer to numerous gods, sometimes by name, sometimes by title, especially by such titles as Ilabrat 'God of the people'(? ), ʾil abīka "God of your father", ʾil abīni "God of our father" and so forth. Various family gods are recorded, divine names listed as belonging to a particular family or clan, sometimes by title and sometimes by name, including the name ʾil "God". In Amorite personal names, the most common divine elements are ʾil "God", Hadad/Adad, and Dagan. It is likely that ʾil is also very often the god called in Akkadian texts Amurru or ʾil ʾamurru. Three pantheon lists found at Ugarit (modern Ras Shamrā—Arabic: رأس شمرا‎, Syria) begin with the four gods ’il-’ib (which according to Cross; is the name of a generic kind of deity, perhaps the divine ancestor of the people), Ēl, Dagnu (that is Dagon), and Ba’l Ṣapān (that is the god Haddu or Hadad). Though Ugarit had a large temple dedicated to Dagon and another to Hadad, there was no temple dedicated to Ēl. In Canaanite mythology, El builds a desert sanctuary with his children and his two wives, leading to speculation[by whom?] that at one point El was a desert god. In the episode of the "Palace of Ba‘al", the god Ba‘al Hadad invites the "seventy sons of Athirat" to a feast in his new palace. Presumably these sons have been fathered on Athirat by Ēl; in following passages they seem to be the gods (’ilm) in general or at least a large portion of them. The only sons of Ēl named individually in the Ugaritic texts are Yamm ("Sea"), Mot ("Death"), and Ashtar, who may be the chief and leader of most of the sons of Ēl. Ba‘al Hadad is a few times called Ēl's son rather than the son of Dagan as he is normally called, possibly because Ēl is in the position of a clan-father to all the gods. I revealed myself to Abraham, to Isaac, and to Jacob as Ēl Shaddāi, but was not known to them by my name, YHVH. Before El's revelation with the name of Yahweh, it is said in Genesis 14:18–20 that Abraham accepted the blessing of El, when Melchizedek, the king of Salem and high priest of its deity El Elyon blessed him. One scholarly position is that the identification of Yahweh with Ēl is late, that Yahweh was earlier thought of as only one of many gods, and not normally identified with Ēl. Another is that in much of the Hebrew Bible the name El is an alternate name for Yahweh, but in the Elohist and Priestly traditions it is considered an earlier name than Yahweh. Mark Smith has argued that Yahweh and El were originally separate, but were considered synonymous from very early on. The name Yahweh is used in the Bible Tanakh in the first book of Genesis 2:4; and Genesis 4:26 says that at that time, people began to "call upon the name of the LORD". For the reference in some texts of Deuteronomy 32:8 to seventy sons of God corresponding to the seventy sons of Ēl in the Ugaritic texts, see `Elyôn. Philo of Byblos (c. 64–141 AD) was a Greek writer whose account Sanchuniathon survives in quotation by Eusebius and may contain the major surviving traces of Phoenician mythology. Ēl (rendered Elus or called by his standard Greek counterpart Cronus) is not the creator God or first God. Ēl is rather the son of Sky (Uranus) and Earth (Ge). Sky and Earth are themselves children of ‘Elyôn 'Most High'. 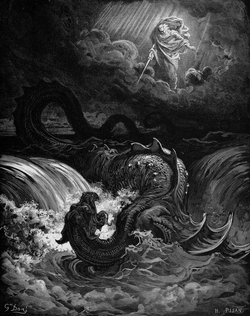 Ēl is brother to the God Bethel, to Dagon and to an unknown god, equated with the Greek Atlas and to the goddesses Aphrodite/’Ashtart, Rhea (presumably Asherah), and Dione (equated with Ba‘alat Gebal). Ēl is the father of Persephone and of Athena (presumably the goddess ‘Anat). Sky and Earth have separated from one another in hostility, but Sky insists on continuing to force himself on Earth and attempts to destroy the children born of such unions. At last, Ēl, with the advice of his daughter Athena and the god Hermes Trismegistus (perhaps Thoth), Ēl successfully attacks his father Sky with a sickle and spear of iron. He and his military allies the Eloim gain Sky's kingdom. In a later passage it is explained that Ēl castrated Sky. One of Sky's concubines (who was given to Ēl's brother Dagon) was already pregnant by Sky. The son who is born of the union, called Demarûs or Zeus, but once called Adodus, is obviously Hadad, the Ba‘al of the Ugaritic texts who now becomes an ally of his grandfather Sky and begins to make war on Ēl. also devised for Cronus as insignia of royalty four eyes in front and behind ... but two of them quietly closed, and upon his shoulders four wings, two as spread for flying, and two as folded. And the symbol meant that Cronus could see when asleep, and sleep while waking: and similarly in the case of the wings, that he flew while at rest, and was at rest when flying. But to each of the other gods he gave two wings upon the shoulders, as meaning that they accompanied Cronus in his flight. And to Cronus himself again he gave two wings upon his head, one representing the all-ruling mind, and one sensation. This is the form under which Ēl/Cronus appears on coins from Byblos from the reign of Antiochus IV Epiphanes (175–164 BCE) four spread wings and two folded wings, leaning on a staff. Such images continued to appear on coins until after the time of Augustus. ^ Cross 1997, p. 14. ^ Matthews 2004, p. 79. ^ Gelb 1961, p. 6. ^ Smith 2001, p. 135. ^ David Leeming (17 November 2005). The Oxford Companion to World Mythology. Oxford University Press, USA. p. 60. ISBN 978-0-19-515669-0. ^ Rahmouni 2007, p. 41. ^ Wellhausen, Julius (1885). Prolegomena to the History of Israel. Edinburgh: Adam and Charles Black. ^ Cross 1973, p. 19. ^ Rosenthal 1969, p. 658. ^ Cross 1973, p. 17. ^ Donner & Röllig 1962–1964, No. 129. ^ Binger 1997, p. 92. ^ Cross 1973, p. 39. ^ Kugel 2007, p. 423. ^ a b Cross 1973, p. 14. ^ Caquot, André; Sznycer, Maurice (1980). Ugaritic Religion. Iconography of religions. 15: Mesopotamia and the Near East. Leiden, Netherlands: Brill. p. 12. ISBN 978-90-04-06224-5. LCCN 81117573. OCLC 185416183. ^ van der Toorn 1999, p. 181. ^ Schwabe, Calvin W. (1978). Cattle, Priests, and Progress in mMdicine. Minneapolis, MN: University of Minnesota Press. p. 19. ISBN 978-0-8166-0825-6. LCCN 77084547. OCLC 3835386. ^ Falk, Avner (1996). A Psychoanalytic History of the Jews. Cranbury, NJ: Associated University Presses. p. 49. ISBN 978-0-8386-3660-2. LCCN 95002895. OCLC 32346244. ^ McLaughlin, John L. (June 2001). The Marzeah in the Prophetic Literature. Leiden, Netherlands: Brill. pp. 24–26. ISBN 978-90-04-12006-8. LCCN 2001025261. OCLC 497549822. ^ Coogan, Michael David (2009). A Brief Introduction to the Old Testament. New York, NY: Oxford University Press. p. 74. ISBN 978-0-19-533272-8. LCCN 2008034190. OCLC 243545942. ^ Smith, Mark S. (2002). The Early History of God: Yahweh and the Other Deities in Ancient Israel. Eerdmans. pp. 32–34. ISBN 9780802839725. ^ "Genesis 3 (Blue Letter Bible/ KJV - King James Version)". Retrieved 8 May 2013. ^ "Genesis 4 (Blue Letter Bible/ KJV - King James Version)". ^ Alt, Albrecht (1929). Der Gott der Väter; ein Beitrag zur Vorgeschichte der israelitischen Religion [The God of the patriarchs; a contribution to (the study of) the (pre)history of Israelite religion] (in German). Stuttgart, Germany: Kohlhammer Verlag. LCCN 49037141. OCLC 45355375. ^ Leeming, David (2005). The Oxford Companion to World Mythology. New York: Oxford University Press. p. 118. ISBN 978-0-19-515669-0. LCCN 2005014216. OCLC 60492027. ^ a b c d Miller, Patrick D. (1967). "El the Warrior". The Harvard Theological Review. 60 (4): 411–431. JSTOR 1509250. ^ Green, Alberto Ravinell Whitney (2003). The Storm-god in the Ancient Near East. Eisenbrauns. ISBN 9781575060699. ^ Donner & Röllig 1962–1964, No. 11, p. 43. and No. 129. ^ Donner & Röllig 1962–1964, No. 26. ^ Jones, Scott C. (2009). "Rumors of Wisdom: Job 28 as Poetry". BZAW. Berlin, Germany: Walter de Gruyter. 398: 84. ISBN 978-3-11-021477-2. ISSN 0934-2575. Donner, Herbert; Röllig, Wolfgang (1962–1964). Kanaanäische und aramäische Inschriften. Wiesbaden: Harrassowitz.